I like this John, I rather liked her. I've been very busy and hadn't taken the time to look at your stuff in a couple of weeks, but more importantly to wish you a very happy, prosperous, and successful 2012. I'm much looking forward to see what you come up with this year. Back atcha!! Have a great 2012. I had the tremendous honor to hear the Iron Lady speak at a dinner. She was amazing! Gracious but powerful. You knew exactly where she stood. And she defended her position with eloquence. 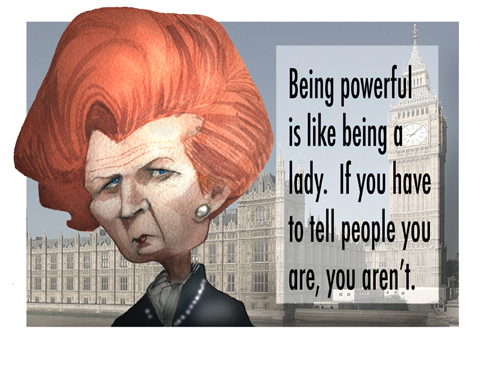 The "Iron Lady" definitely was not of the PC crowd. She meant what she said. So... Is the converse true for those who tell us (ad nauseum) how much more "caring", "generous (with other peoples' money)", "smart", & "not racist" they are? Even though your question is rhetorical, I'll answer - YES (the people who claim those aforementioned traits are often the biggest, nastiest d!cks on the planet). Nicely done, John. Excellent quote too. I've always had a thing for redheads. That said, the UK and the world could desperately use another Maggie Thatcher right now and also another Ronald Reagan. Alas, I see no heirs to their legacies. Thanks for the nice word. I can imagine the Streep film, "Iron Lady", will showcase her toughness. This page contains a single entry from the blog posted on January 4, 2012 5:26 PM. The previous post in this blog was Graphite Study: "David" hand.